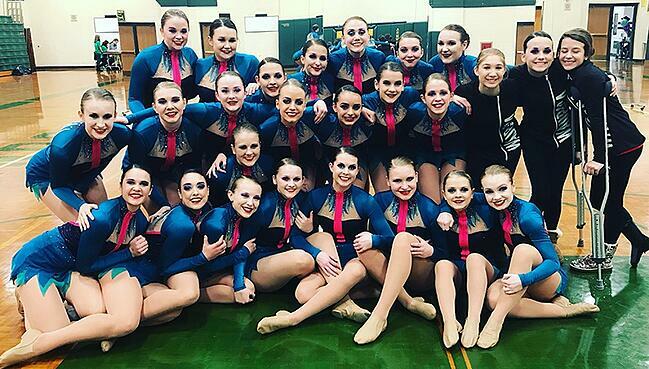 This year, Waupaca Dance Team created two bold, custom costumes inspired by French fashion house Balmain, and their lead designer Olivier Rousteing! The team always likes to stand out from the competition with a unique look, which makes collaborating with the team and coach Amy Marcom on their custom designs each year so fun! Drawing from Balmain's rigid lines, pattern mixing, and graphic designs for both design-from-scratch costumes, Olivier Rousteing was the perfect muse for Waupaca's Dance Team. Amy got the custom design process started off on the right foot with plenty of inspiration photos, including a few Balmain pieces. 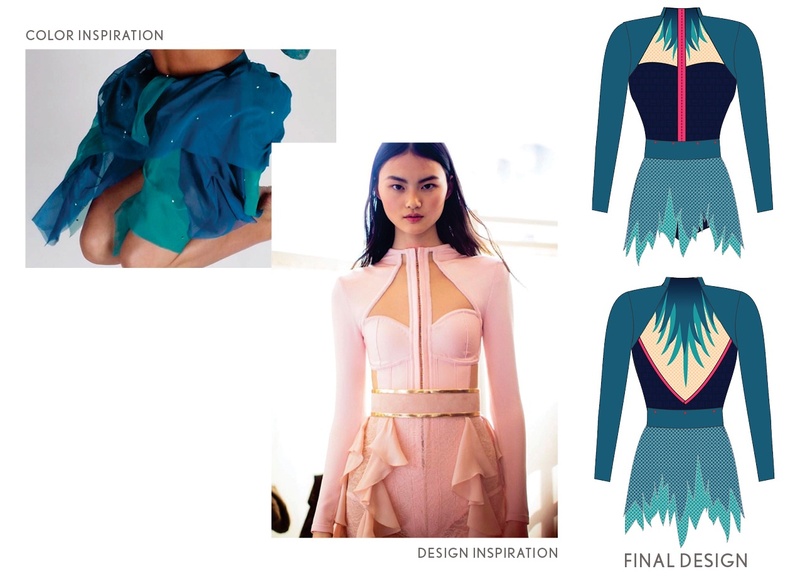 "Amy is good at picking certain design details that she loves from her inspiration photos and allowing us to help her piece them all together into one unique costume," said Line Up designer Michelle, who collaborated with Amy on the designs. The inspiration photos allowed for plenty of design focus, as well as a creative and unique final look! "For our jazz costume, our vision was an earthy and edgy vibe, with a pop of glam," explained Amy. "We love the coral zipper up the front as a fresh idea, and an intentional visual. Of course, the rhinestones also add so much depth to each of the costumes." 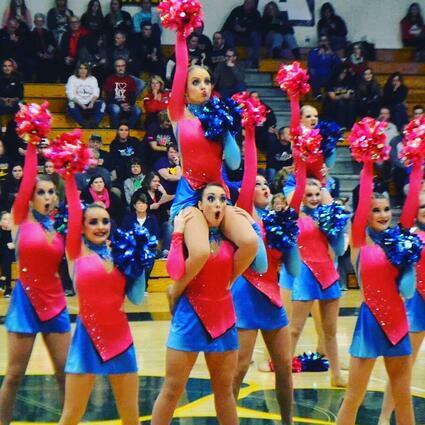 Waupaca Dance Team is NOT afraid of color, which is evident in their brightly colored costumes. In fact, the team has a bold and long standing color tradition. "Our Pom dress is always a red/pink and blue pairing - this has become a signature for our team," said Amy. 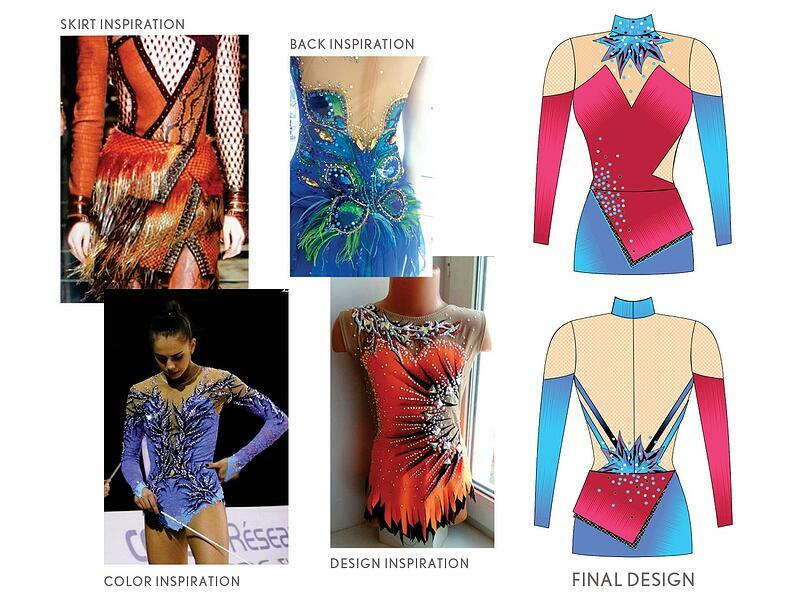 Using sublimation, a technique that allows for custom colors and designs to be printed on fabric, the team was able to create the rhythmic gymnastics inspired motif on the neck and the back of the costume, as well as a unique color combination. "Finding the perfect color combination is usually the part that is hardest to nail down," account manager Megan, explained. "We typically do several rounds of sublimation color swatches for her to see so we can really get it right." The final pom uniform was the perfect balance between sporty and feminine! 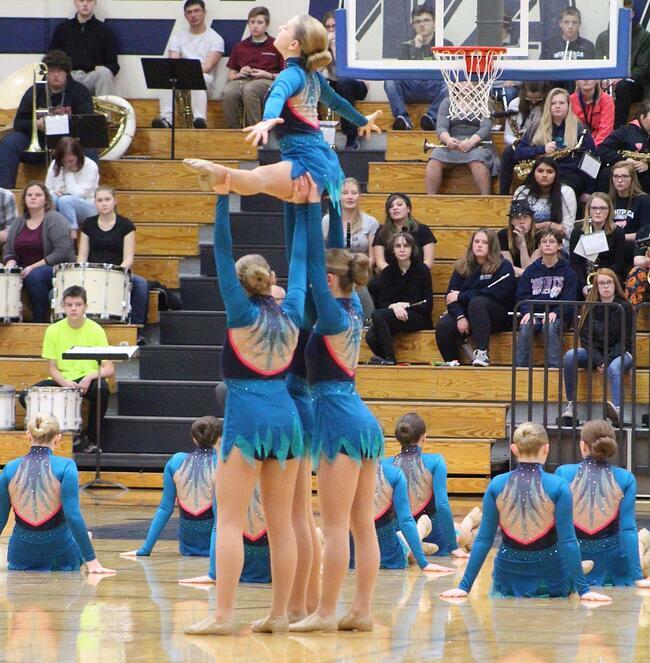 Check out more Q & A with Waupaca HS Dance Team below! 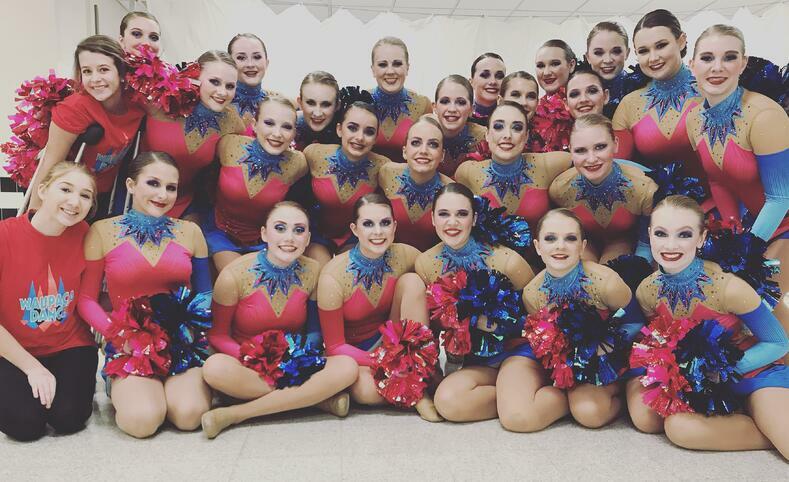 Waupaca Dance Team pulled inspiration from many looks to create their one-of-a-kind custom Pom dress! 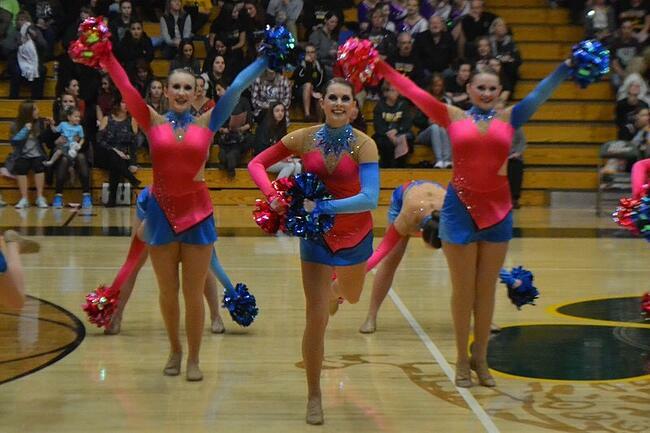 Our Pom music is an incredibly FUN mix with songs like My Chick Bad and Work by Jessie J. Our Jazz is a fierce and dynamic remake of an amazing classic by Fleetwood Mac. Choreographing each piece was also exciting, as the music gave us so much to work with. Our team is unique because we really love to do our own thing. We consistently try to bring new and exciting ideas to our season, whether it be in our routines, our costumes, or how we challenge each other to be better teammates. We encourage our dancers to be leaders, by inviting them to contribute their ideas to increase ownership of the journey. Working together makes the season so rewarding! Our favorite memory so far would be the first time we walked off the competition floor and had that overwhelming feeling of TEAM. This season, half of our team are freshmen! We were anxious about getting all of them up to speed, and ready for competition. When we walked off the floor for the first time, we knew our newbies were going to be amazing! The positive, hard working spirit is our biggest asset, but having fun doing it, is the cherry on top! We love The Line Up, and their patience in understanding and creating our vision. They are never afraid of our ideas, and make us feel like anything is possible! !